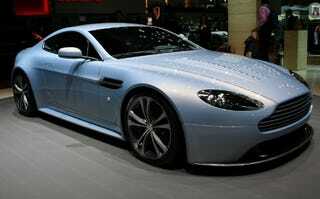 Ask not how many alcantaras were killed to fashion the interior of Aston Martin's Vantage RS. Merely ask why it's one of the sexiest cars in Geneva. Naturally, it just is. But the Vantage RS is not only a looker. It's also Aston's answer to the Porsche GT3. That's by way of a 4.3-liter V8 upclocked from 380 HP to 420 HP by way of variable valve timing. The company says it'll do zero to 60 in 4.5 seconds and 0 to 100 mph in under 10. It's also been lightened to the tune of 330 pounds, which is where the alcantara comes in. Full circle.